Cameron and Rebecca Stern know sprinkles make everything better, including jewelry. You know sprinkles take ice cream from plain to marvelous. But did you know the same is true for jewelry? Cameron and Rebecca Stern pay tribute to the tiny, colorful bits of life with their cheerful necklace. 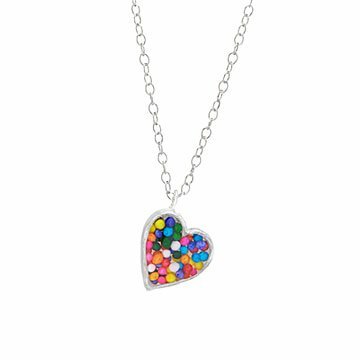 They craft the sterling silver pendant from a 3D-printed mold and fill it with "specimens" engineered to induce joy, like the pinches of rainbow sprinkles seen here. Equal parts nostalgic and original, the adorable piece is sure to put a smile on the face of your favorite foodie or kid-at-heart. Handmade in New York. A Brooklyn native, Rebecca Stern graduated from the Pratt Institute with a degree in jewelry design. Cameron Stern was a touring theatrical technician and designer before becoming the "lead robot wrangler" in the Brooklyn studio they share. Together with their team, they combine old and new techniques, ideas, obsessions, and inspirations to create work that resonates and delights. They might also be found whipping up delicious desserts (Cameron’s a trained pastry chef) and teaching cartooning (Rebecca makes the world her classroom).